Last week I’ve make a blog post about social business nightmare. One way to avoid it is related to change management (THE WORD, even if now it is not the same concept than during the 90’s), to support your organization transformation, so a a change of mindset and a cultural evolution toward social business. 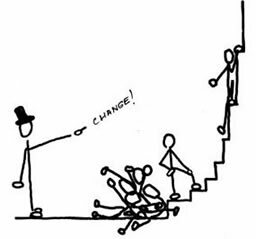 About this « new » change management, it’s not about tool training, we are not in an ERP support programm, let’s talk about agility and adaptability. Quick come back on the last week blog about the gouvernance issue. Is the governance I am setting up is matching with a social business project. Especially the empowerment of my employees, with more autonomy. More than just the acceptance, it’s a support issue. It’s not self-managment, but giving the requisite ressources to support the employees on this path. Coming back on this governance issue is important because related to the leading and success of the project. By giving rooms to my employees, in the opposite of the classical change management program which consist to take them from A to B, I don’t travel on a highway. No check point between A and B. To spin the metaphor, I am not anymore on a highway, but in a garden. My key players are gardeners and their tasks are different. My garden has to flower, but there is many possibilities, not only one way. It’s organic, so there is a part of chaos in the way my plants will flourish. Again it is not an self-management issue, else your garden will be non fertil. To make my plants grow, I’ll help them. So there is some fertilizer, like the enterprise social network. But tricks too, to support your employees in the shift of their mindset to a more collaborative one, align on the business process. Kind of gardians to support the rods. But not all the flowers will grow at the same pace or exactly in the same way with different shapes. There is a part of doubt, even if there is some key points, but it is organic, not mechanical so… It is from this organic part that you will learn the most, get the most value from unexpected part. Ce contenu a été publié dans entreprise 2.0, management 2.0, Post in english par Anthony Poncier, et marqué avec change management, enterprise 2.0, garden, highway, management 2.0, social business. Mettez-le en favori avec son permalien.